You can reserve a custom aircraft tail number, or N-number, just like you can reserve a personalized automobile license plate. You don’t have to wait until you are ready to actually register, you can reserve the N-number right now. I reserved mine three years before I was complete. That way, I knew I would get the number I wanted. Here's how. Do you know where to find information on custom tail numbers in countries other than the US? If so, please contact me, and I'll post the links here. Make a list of the five or more custom tail numbers you would want. In a moment I'll describe how to see which numbers are available, and then you will need to turn five numbers in. If some of your first choices are not available, add some more and check them out, until you have a good list of five available numbers. An N-Number may not begin with zero. You must precede the first zero in an N-Number with any number 1 through 9. For example, N01Z is not valid. Registration numbers N1 through N99 are strictly reserved for FAA internal use. To avoid confusion with the numbers one and zero, the letters I and O are not to be used. 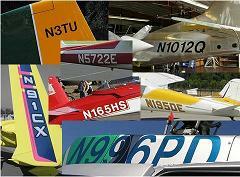 Once you have a list of at least five N-numbers, go to the FAA registry to check availability. Here you can type in the number range you are interested in, and any trailing characters you want to use. The search will return all available numbers that meet your search criteria. For example, if you want to use “N456AB”, you can type 450 in the starting range, 460 in the ending range and AB in the trailing characters fields. If the search returns “456AB”, it is available for your use. If one of the numbers on your list is not available, scratch it off your list. If your list has less than five numbers, create some more and repeat this availability check until you have at least five. If you have more than five available numbers, keep your favorite five. Next goto the FAA's N-number reservation page and follow the directions, loading in your five N-numbers, in your order of preference. 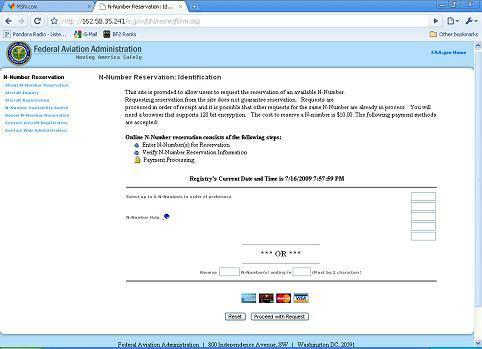 You insert your top five N-numbers in order on the right side of the screen, then continue on and pay the $10 fee. You will have to wait for a letter from the FAA telling you which of the five N-numbers you got. If you think it has taken too long, you can always call the Aircraft Registration Branch of the FAA at 1-866-704-4715. The way I understood things, if you have done the research, and the five numbers you listed are all available, the only way you won’t get your top choice is if, in the short time between you checking availability and processing the application, someone beats you to it. You will have to renew the reservation every year. The FAA will send you a letter and renewal form, or you can do it on line at their N-Number renewal page. It will cost another $10 each year.